Adapting to eating within the constraints of the FODMAP diet has taken time. Learning to cook without onion and garlic and giving up apples and pears have been quite an easy task if you compare it to adjusting to life without wheat. I’ve never been a fan of flabby sliced bread sold in a plastic bag, we have always been a household that uses a bread knife to saw off chunks off a crusty sourdough loaf. After six months of experimenting with locally milled spelt flours, I now know why modern wheat grain was selected for cultivation. It has a unique gluten that so other grain can begin to emulate, no matter how adept the baker. Trying to reproduce a much loved food with restricted or substituted ingredients has led to disappointment, so rather than continue trying to improve my 100% sourdough spelt bread, I’m moving on. I’m happy to eat toasted commercial spelt bread for breakfast, but now I have a list of savoury muffins and loaves to try out that will potentially make a delicious aside to a bowl of soup or salad, taste good topped with cheese and even toast well, once past it’s prime. No more hankering after what cannot be. I have no idea the source of this recipe. It was lovingly handwritten by me in my blue recipe folder at a time when I carefully formed each letter of each word, at least 20 years ago. I have no recollection of ever making it before, though only recipes that had been successfully tested were given space on those hallowed pages. It has earned the right to be there now! We loved this loaf. It was savoury with herbs, carrot sweet, textural thanks to the polenta and moist from the addition of yoghurt. While still warm from the oven we had to stop ourselves from over indulging. On day two it was still fresh enough to enjoy with a bowl of vegetable soup, then on day three warm after a quick flash under the grill we enjoyed the crisp carrot and cornmeal soda bread with thinly sliced cheese. Grease a loaf tin and line it with baking paper. 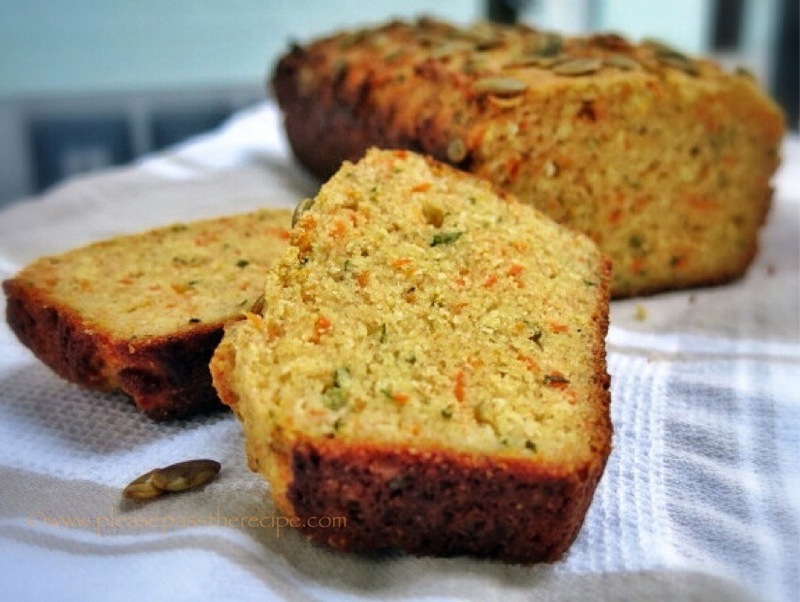 In a large bowl mix together the flour, cornmeal, soda, herbs, carrots and seasonings. In a separate bowl whisk together the yoghurt, eggs and melted butter. Mix the wet ingredients into the dry ingredients and stir well to thoroughly combine. 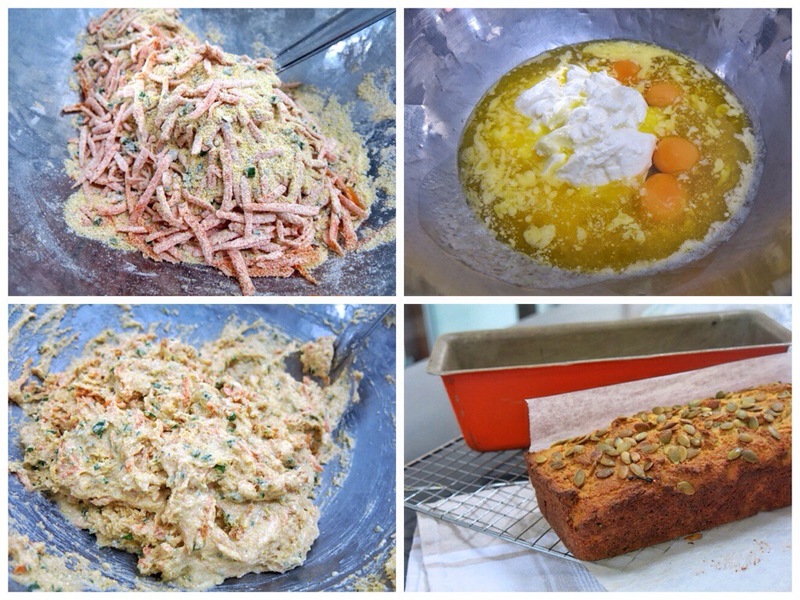 Tip the mixture into the prepared loaf tin, sprinkle the pumpkin seeds on top and press then lightly into the batter. Bake the loaf for 45 minutes or until it is done when tested with a skewer. Remove the loaf from the oven and allow to rest in the tin for 5 minutes before turning it out onto a wire to cool. Had not heard of the diet … the bread looks temptingly inviting and delicious! This looks like a really interesting recipe, hearty and moist. Thank you! I, too, had to look up the FODMAP diet and, I have to admit, I’d have a rough time following it. If, however, it made my digestive problems vanish or even lessen, I’d become a follower. 18 months? Congratulations. I’ve already pinned this recipe. I’m going to love it when “soup weather” returns. I’m also sending it to friends and family with digestive issues. Thank you so much for sharing your recipe with us. I will try this for sure! It may sound weird, but I’d like to try this with fish in cream sauce… I have strange cravings sometimes 😉 It looks stunning too! – I had never heard of FODMAP diet (I must be in a cave) and checked it out just now. Wow, there are so many constraints. No onion, garlic and wheat products… and it goes on and on. 😦 Much power to you, and please let me know in a few months if it has truly helped you. I’ve been following this diet for 18months Fae, it has made a huge difference to my wellbeing. People on special diets can be such bores, I have tried to keep it low key…. This bread sounds so lovely Sandra. I would love to make it with a nice bowl of bean soup. I am saving this one. I love how you mentioned how you carefully formed each letter of each word on the recipe. I remember writing like that (year’s ago) now…not so much. 🙂 Has my patience run out since using a keyboard? Now I can get the letters down fast enough! Love your combination of pumpkin seeds, chives, maple syrup, yogurt and polenta. It’s a fabulous combination. Thanks Seana, my hand writing is atrocious now, is it the keyboard or pressure of time? Thanks Stefan. Some people think bacon makes everything taste good, i prefer butter! It was Glenda, but not bread….. I love the texture that polenta gives to bread and cakes. Let me tell you that this loaf looks amazing, I’m glad you’ve decided to make it despite its source is unknown, I’m sure whoever it’s his “inventor” you made him/her very proud! Thanks Marguerite, it was truly delicious. Looks fantastic and a pretty darned good substitute! I buy the Brasserie Breads sourdough spelt loaf which is bloody beautiful but not available everywhere. Ooo I just got excited and did a web search of Brasserie breads, they are here in Melbourne! Sadly their Spelt loaf contains wheat. Edwards Bakery, stocked by Coles, makes a sourdough 100% spelt loaf which makes fabulous toast. It’s that crisp crustiness I miss the most……. Oh man, sorry to lift your hopes just to be dashed to the ground. Bills Stoneground sold in Coles also does a spelt and I thought it was 100 per cent but don’t quote me on that and I could be wrong and they often don’t have it. The Common Ground, a hippy/cult group sell a few GF sourdoughs and other interesting wheat variety sourdoughs at our growers market but I am not sure if they sell them anywhere else. The coeliac hubby likes their buckwheat sourdough and they do a spelt but again, not sure if it’s 100per cent. At least your soda bread looks rockin! Sounds like the perfect bread for a variety of soups – or simply with chilli con carne. I love the addition of all the herbs. So sad that you haven’t been able to reproduce that sourdough bread with spelt – but with this and similar breads it softens the disappointment. Sounds divine. With this weather, I am right into breadmaking. This one will need printing off. Might make it tomorrow. Thanks Francesca, it will be a good day tomorrow to stay home and do some baking brrrr!! Enjoy…. This entry was posted on July 31, 2014 by ladyredspecs in Baking, Breakfast and Brunch, FODMAP diet, Food, Light Savoury Dishes, Savoury Baking, Side Dishes & Salads, Vegetarian and tagged bread, carrot, cornmeal, FODMAP diet.